Photo of the day: What did the big bag say to the little bag? Be-atch, stop sitting on me! I can never remember that stupid saying. If I see nothing I say something? Nope, that’s not it. If I see something I say nothing? Nope that’s not it. Damn, who left these very unmatched bags unattended in the middle of the airport? I’m going with , if I see something I say nothing, yeah that’s it, other wise I’ll be here all day filling out forms. The Air Boss is in the shop. Jabba the Hutt now moonlighting as a baggage handler to make ends meet..
What do you mean, this is London, Ontario? “hi there i got my own blanket..
haha…i was wondering how long it would take befoe someone brought up the leg! Hey you below me … Just because I carry the laptop, the iPad, his money, and his “I might get lucky at the airport” condom, doesn’t mean you have to get green with envy. Checked, maybe. Gate Checked, never! Hi, I’m the left-legged pilot. I only fly airplanes with just a left wing. 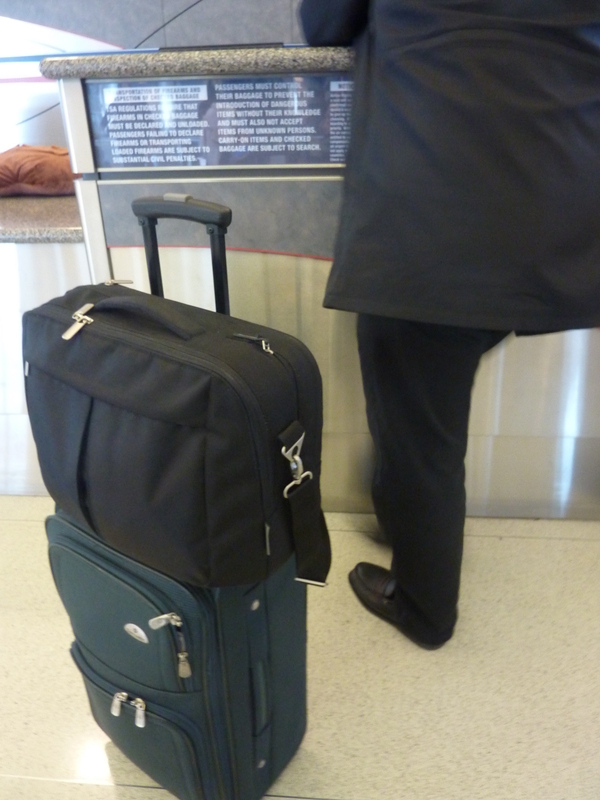 Neither the man nor his bags would face each other after the angry words they exchanged in the security line. In an effort to hide his propensity for color co-ordinating with his luggage, pictured businessman conceals his right foot that dons a hunter green loafer. whoever you are, you’re very funny! One way to get a leg up on the competition in the upgrade battle. Seriously, this habit is dangerous as its easy for someone to walk by and off with your stuff. A colleague of mine had this happen while checking into a hotel. My daughter flies for you, any chance I’m getting on this flight?